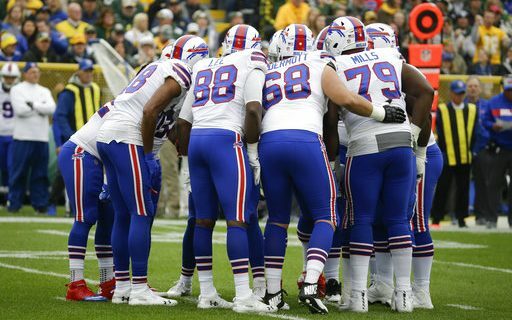 After reaching the Playoffs in 2017 for the first time in nearly 20 years, many fans had hoped the Buffalo Bills could follow up with a similar type performance in 2018. After four games of the 2018 season, we already know that isn’t going to happen. In order to win in the NFL, teams have to have a minimum of four things: Good quarterback play, a strong offensive and defensive line, and excellent coaching. The way I see it the Bills may have just one of those components and that is strong defensive line play (and that is debatable). Since Sean McDermott and Brandon Beane came aboard it seems that their first thought has been to rebuild the Bills into their likeness. They have systematically gotten rid of any player who they feel is not a “fit” for their vision. What that has done is leave the Bills shorthanded for the 2018 season. They just don’t have a strong enough roster to compete on a weekly basis with the rest of the NFL. Yes, the Bills went into Minnesota and played a fabulous game and came away with an easy victory over one of the better teams in the NFC. The Bills though could not follow that up with an equally strong performance at Green Bay last week. Unfortunately, that is what Bills fans will have to expect from their fans the rest of the season. There will be games in which they get lucky and put it all together and come out with a win but looking at the schedule, these games will be few and far between. At this point, I would say that the Bills will be lucky to win five games on 2018. After last year, that is a disappointment but let’s face it, the Bills roster is weak and in need of quality players. Looking at the rest of the schedule, things don’t get easy. This week the Bills host the Tennessee Titans, who presently sit at 3-1 and are on top of the AFC South. The following week it’s off to Houston to play the Texans. While Houston has the same record as the Bills, they are very strong on defense and have a very strong pass rushing team. As we know, one of the Bills biggest weaknesses is pass protection. After that it’s at the Colts where the Bills will have a chance if only because the Colts can’t keep key players healthy. Then, its two home games against the two of the better teams in the NFL this year in the New England Patriots and the Chicago Bears. Both of those clubs are leading their divisions as I write this. So as you can see the Bills could get through nine games and have only two wins. What does that mean? First off it means that the Bills will be drafting high in the 2019 NFL Draft. Drafting high doesn’t mean they will get quality players, it means they will have the opportunity to get quality players. The onus is on the personnel department to have the potential draftees graded correctly. At this time the Bills have 10 picks in the 2019 Draft but they don’t have multiple picks in a round until the fourth round. Those extra picks in the later rounds can help them move up in earlier rounds to select coveted players. The other thing the Bills will have is a lot of cap space in which to sign veteran free agents. I have read more than once, articles that have asked why would a free agent want to come to Buffalo? What do the Bills have to offer? For me, the answer is easy, the Bills have a strong coach who is well respected around the League and plenty of money in which to sign players. The key in free agency isn’t signing a lot of players, it’s signing the right players. Players who will be good fits not only on the field but in the locker room. I don’t think the Bills will have any problem getting that done. What do Bills fans have to look forward to this year? Not much, but if they are patient things will get better as soon as next year. The Bills were put in this hole because of the moves of the previous front office and coaching staff. It takes times to fix all their mistakes but as the Los Angeles Rams and Chicago Bears have shown, the fix can be done fairly quickly once they have the young quarterback in hand. The Bills do in Josh Allen.